I gave four lectures last weekend in Rochester, New York and got a number of questions about tracing Huguenots in England and Ireland, thus I thought appropriate to share this review. 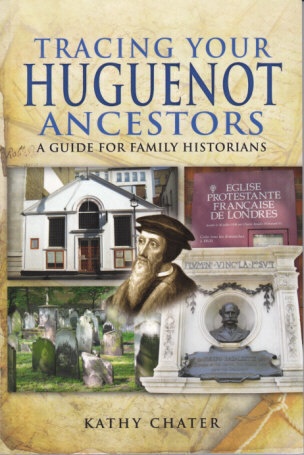 Tracing Your Huguenot Ancestors: A Guide for Family Historians. By Kathy Chater. Published by Pen & Sword Family History, 47 Church Street, Barnsley, South Yorkshire S70 2AS, UK. www.pen-and-sword.co.uk. £12.99. US Distributor: Casemate Publishing, 1016 Warrior Road, Drexel Hill, PA 19026. www.casemateathena.com. US$24.95. Australia sales from Gould Genealogy and History. www.gould.com.au. AUS$29.95. 2012. 152 pp. Illustrations, index. Softcover. Between the sixteenth and eighteenth centuries many thousands of Protestants fled religious persecution in France and the Low Countries (modern day Belgium, Netherlands and Luxemburg). They settled in the German Protestant States and the British Isles, some permanently while others later migrated to North America, the West Indies, South Africa and Australia. The book opens with a very good summary of the wars and religious conflict that led to these migrations, reminding us just how important religion was in the lives of our ancestors. The book focusses on the communities within Great Britain and Ireland. It clearly identifies and summarizes the history, development and decline, of the specific Huguenot and Walloon communities in London, Kent, East Anglia, the West Country, Ireland, Scotland and the Channel Islands. Ms. Chater continues by suggesting a research plan with issues to consider. This is not necessarily easy for the wealthy tended to choose to assimilate joining the Church of England, seeking business and education opportunities, while the poor needed the support of their own community. The Huguenot communities could easily be connected with the Church of England or the Dissenting Churches (Congregationalists, Baptists, English Presbyterians) and often with specific occupations so a broad research perspective is required. A nice research checklist is provided of both specific and general sources, with chapters for each. The chapter on specific resources is very valuable addressing: denizations and naturalisations; returns of strangers; Huguenot church records, going beyond the church registers; poor relief and charity records; schools; charity apprenticeships; friendly societies; wills; other foreign churches. What is nice is that these records are not usually high on the priority list for researchers and so their importance and specificity for this community is valuable. The chapter on general sources points to more commonly used records, but again highlights what to look for that might clearly identify people from this community. The closing chapters address how to research Huguenot communities with individual European countries, and the rest of the world, including briefly North America. The bibliography includes a complete listing of all titles in the Huguenot Society Quarto Series and New Series, plus how the titles have been combined and reissued on CD-ROM, along with a select bibliography. Compared with other volumes in this series the bibliography and guidance for further research is one of the weaknesses in this otherwise up to date research guide. For example, though the chapter on the religious wars and Edicts in Europe that created this migration is well summarized there is no guidance in the chapter or the bibliography for researchers who want to know more. It should also be pointed out that when discussing the European Huguenot churches mention is made when the records have been microfilmed by the Family History Library, while no mention is made of which British Huguenot church records have been filmed. This is a useful, up to date, practical guide for anyone who has, or thinks they have, Huguenot ancestors in the British Isles. It provides social and contextual assistance along with guidance on what records have survived, where to find them and how to use them. 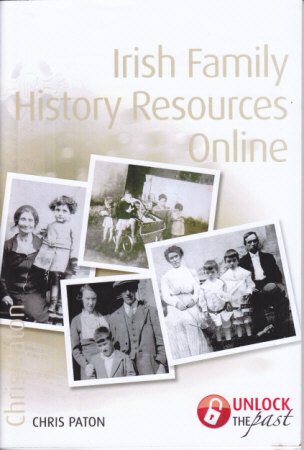 Irish Family History Resources Online. By Chris Paton. Published by Unlock the Past, P.O. Box 675, Modbury, SA 5092, Australia. www.unlockthepast.com.au. 2011. 75 pp. Illustrations, index. Softcover. AUS$19.50. Online access to indexes and images is growing rapidly for Irish research, often with the same sets of records being available in multiple locations. This book is an expanded adaption of a lecture Mr. Paton gives, it shows and I loved the format and writing style. The book begins by discussing records to identify who the Irish were, specifically: civil registration; church records; burial records; wills and probate; biographical databases and heraldry. It moves on to examine where the Irish were: censuses; street directories; land records; maps and gazetteers. Further sections address the major archives and libraries, newspapers and books, and a final catchall section covering: gateway sites; military, police and law; emigration; and some miscellaneous sites. The book is not a listing of websites. So what makes this book different and so useful? Unlike many Irish research books that describe what the records are and contain, this book clearly presents how to search and use the records. For example, in the section on Civil Registration the book clearly shows how to access the indexes using FamilySearch and Ancestry, what different information each provides. It continues by showing how to use the information provided to obtain a certificate or photocopy of the registered birth, marriage or death event through different avenues, with clear suggestions on cheaper alternatives. For the section on Church Records the book online identifies resource guides, commercial and free websites, often outlining their specific strengths, contents, limitations, costs and search techniques. Throughout the book there are numerous clear color screen captures of numerous websites giving it a lot of visual appeal. All web addresses are in bold so they stand out in the text making them easy to locate and retype into your own browser. The book is also well indexed by subject and location. This is a book that I intend to keep close and handy to my computer. It is a very practical guide to Irish online research with lots of good practical suggestions. A few of my readers have asked that I specifically mention when and where I am going to be speaking as they would like to come and hear me again. So I will try and do this on an occasional to highlight upcoming events.